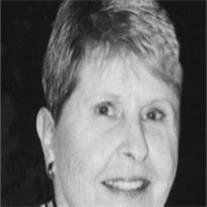 Patricia A. Decker of Sun Lakes, AZ, passed away March 19, 2010 of cardiac arrest. She was preceded in death, in 2006, by her husband William. She is survived by her two sisters Jeanette Crow of South Haven, MI and JoAnne Williams of Haslett, MI. Also survived by three sons Dean (Beth) of Marietta, GA, Dan (Kate) of Hastings, MI, David (Diane) of Cincinnati, OH and her 7 grandchildren. She moved to Sun Lakes in 1987. Patricia was a homemaker, raising her three sons. She enjoyed reading, laughing, whistling, and anything Irish. She was a member of St. Stevens Catholic Church. A devoted mother, she was dedicated to her faith, loyal to her family and always proud of her country. Family requests that memorials be sent to goredforwomen.org/donate.aspx or St. Basil’s Catholic School Endowment Fund. Mass of Christian burial was held at Wednesday, March 24, 2001 at 9:30 AM at St. Stevens of Sun Lakes. Graveside ceremony followed at Valley of the Sun Cemetery, Chandler, AZ. Arrangements by Bunker’s Garden Chapel.